Old map by Gottfried Hensel / Homann Heirs -AFRICA Poly Glotta Scribendi Modos Gentium. . . Title: AFRICA Poly Glotta Scribendi Modos Gentium. . . Size: 7.2 x 8.9 inches. Condition: In very good condition. Lightly age toned. 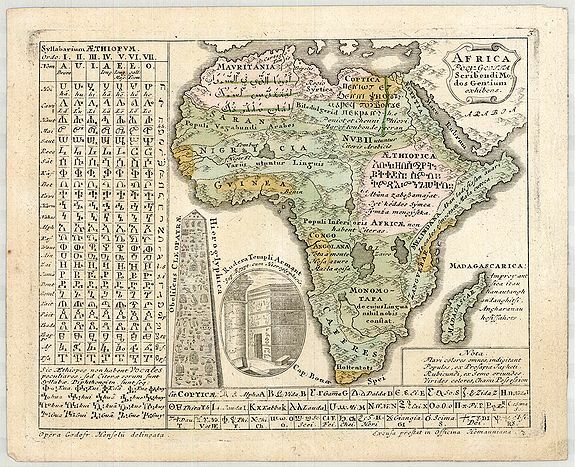 A rare separate thematic map of AFRICA from the set of 4 maps of the continents, identifying the distribution of languages of the world from "Synopsis Universae Philologiae. ". The map identifies the different countries and linguistic divisions, with tables displaying their script, alphabets and spoken languages. Important in the history of thematic mapping, this is one of the first to use color to distinguish areas and subjects on a theme. Homann Heirs was a German publishing firm that enjoyed a major place in the European map market throughout the eighteenth century. Founded in 1702 by Johann Baptist Homann, the business passed to his son, Christoph, upon Johann’s death in 1724. Christoph died in 1730, aged only 27, and the firm was inherited by subsequent Homann heirs. 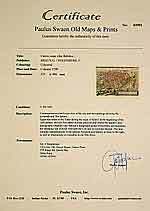 This altered the name of the company, which was known as Homann Erben, or Homann heirs. The firm continued in business until 1848. Reference: McLaughlin #229; Robinson, pp 55-56, and 130-132..